Once upon a time there was a mellow flower child. She badly wanted world peace, but didn't know how to bring it to happen. Maybe it's all in the bell bottoms, she thought. Or, we can dig on essential oils and sunshine, she mused. She meditated and did a ton of yoga to channel all her zen. Then one day she decided that wearing the Peace Pendant Necklace would promote the idea of zen to all her friends. 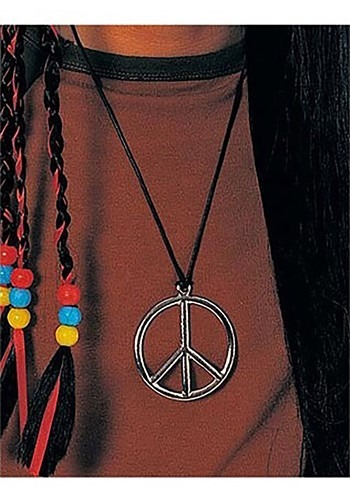 This beautiful Peace Pendant Necklace is perfect for your hippie themed costumes. Whether you are a cool peace loving chick or dude from the 60s or 70s. Or, you just need a groovy Halloween accessory this is the one to bring peace into your life. The attached silver pendant dangles from a black cord for your instant hippie look.